It’s not a stage of life most of us tend to discuss but our final days, weeks or months are sometimes complex time for ourselves and our loved ones. Emotions can run high, physical energy can be low, and our ability to adjust to change can be compromised. Manager Pastoral Services Jenni Ashton says there is a propensity for people to put their own expectations of end of life care onto those who are dying. “If we are social people, we can sometimes expect that our relatives would enjoy a lot of people being around, when in fact they may feel more comfortable with periods of being alone. 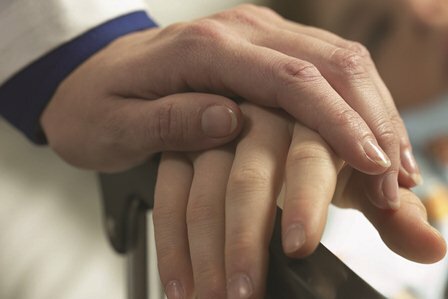 The Pastoral Services team at St John of God Murdoch Hospital encourages people, through gentle conversations and reflection, to contemplate their life and their current situation. “These conversations can provide an opportunity for people to review their life, and/or create space for families to express their emotions and show their gratitude to their loved one,” says Ms Ashton. We didn’t like the idea at first. We were unsure and maybe even a bit frightened. We thought that in some strange way it might make it all too real, too confronting. We all knew our sister was not going to make it through another Christmas, but we weren’t ready to see her in a hospice. She wanted to die at home, and we wanted that too, but it was obvious that this was going to be much harder than any of us thought. When the doctor suggested Jane go to the hospice to manage her pain, we were reluctant. I think we felt a bit guilty that we couldn’t manage her on our own and then we wondered if the doctor knew something that we didn’t. Was she closer to the end than we thought? The doctor reassured us that the admission to the hospice would be short term and that it would give us a chance to get a few more things in place for Jane at home. He also explained that it would help Jane come to terms with what was happening to her. Leaving her husband and young children, was a heavy burden Jane was carrying, in addition to her pain and distressing symptoms. None of us anticipated the true value of this admission. Not only was Jane surrounded by a variety of health professionals who were able to manage her physical pain, but with the support of the Pastoral Services caregivers and the Counsellor, she was also able to talk about her emotions and her overwhelming sadness. Through these conversations she was able to express herself in a way that helped her find some clarity about her situation and maybe even a little bit of hope. Together with the Social Worker, these people helped Jane write farewell letters to her children; access additional home care; and gave her the confidence to talk to her husband about her funeral wishes.